Dance socially with other dancers, and have fun. Leaders improvise the dance, signalling to their partners what the leader would like the partner to do next. Followers read the signals given by their partner, and respond to the lead. 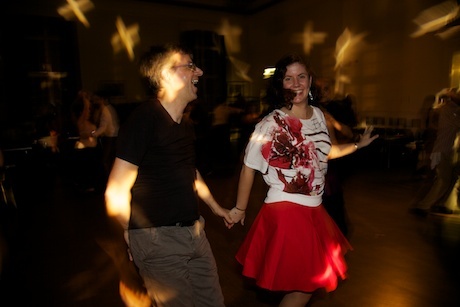 This allows people who have never danced with one another before to improvise a dance and dance socially with someone they have not met before. Events, party nights, congresses and holidays allow dancers to come together to dance. No need to bring a partner, everyone will get an opportunity to dance with everyone else. You can ask anyone to dance, and other dancers will ask you to dance with them. A good leader will pick up the skill level and preferred dancing style of their partner and lead accordingly. For more information, please read our list of frequently asked questions. Join us on the first friday of every month for the Beckenham Bash friday night party. The style of Salsa taught is the "LA Style", "On-One" or "Crossbody Salsa", named from the predominantly linear movement of the couples as they dance. The basic step is danced to the count of 8 beats, with emphasis on the 1st and 5th beat. The 4th and 8th beat are used as "pauses", or the "slow" counts. The style is one of the most popular danced worldwide and in the UK, enabling you to dance with thousands of other salseros and salseras globally. There are many other styles of Salsa, including the "New York Style" or "On-Two", Cuban, and more specific styles within these catagories. They are all beautiful and wonderful in their variety. However for the begineer we recommend that you stick to one style for a while, until you have mastered the basics and a little beyond. 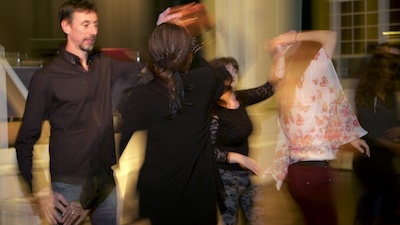 From time to time, classes are offered covering Bachata and Cha-Cha-Cha. Join us at one of our Thursday Classes. See the Thursday Schedule for details.